This map shows how deep deep you would have to dig to find water ice on Mars. 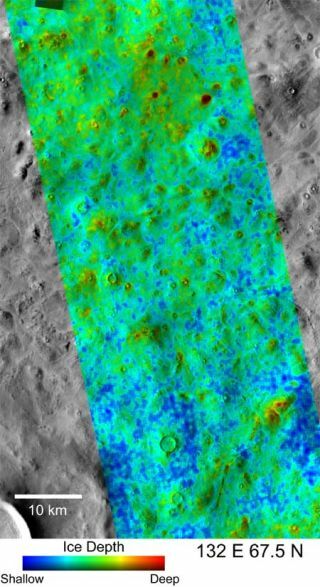 It is shown in false colors and was made using THEMIS temperature measurements. Blue shows where ice would be 5 centimeters (2 inches) deep, while red shows an ice depth of more than 18 centimeters (7 inches). The region lies at 67.5 degrees north and 132 degrees east, and the scale bar is 6.2 miles long. Click on the image to download a 1.7MB version. A robotic lander might have to work harder to dig for ice on some parts of Mars than others. New findings show underground ice depth can vary significantly on the Red Planet, being right at the surface in one spot but several feet down nearby. "We find the top layer of soil has a huge effect on the water ice in the ground," said study author Joshua Bandfield of Arizona State University. The research, detailed in the May 3 issue of the journal Nature, has implications for NASA's Phoenix mission, designed to drill down to sample the Martian ice. Bandfield found the nature of the Martian topsoil determined how deep the ice was below it. Areas with many rocks at the surface "pump a lot of heat into the ground and increase the depth where you'll find stable ice," Bandfield explained. In contrast, dusty areas tend to insulate ice, allowing it to climb closer to the surface. "These two surface materials-rock and dust-vary widely across the ground, giving underground ice a patchy distribution," Bandfield said. It was previously thought that Martian water ice was located at average depths of about 3 to 6 feet (1 to 2 meters), but Bandfield's new study shows it can be found as close as 2 inches (5 centimeters) from the surface. Bandfield used computer models to analyze infrared images of water ice taken with the Thermal Emission Imaging System (THEMIS) on NASA's Mars Odyssey orbiter. The THEMIS images have about 5,000 times higher resolution than those taken by another Mars Odyssey instrument, the Gamma Ray Spectrometer (GRS). Whereas the smallest object GRS could resolve was 300 miles (500 km) wide, THEMIS could spot details the size of a football field. The patchy underground ice distribution means care should be taken when picking a landing spot for Phoenix, a NASA lander now set to launch later this year on a mission to sample Martian ground ice directly and learn more about the water history of Mars. Phoenix "may find ground ice is shallower and much easier to reach in some spots than in others," Bandfield said. Zoom in: Water on Mars? Mars Madness: A Multimedia Adventure!